This delicious Chinese favorite can feed 8-10 people and a promised crowd pleaser!!! Soak your tree mushrooms in hot water for 20 mins. Then, cut off stems and slice into thin strips, put aside. In a large stockpot, bring chicken broth to a boil. 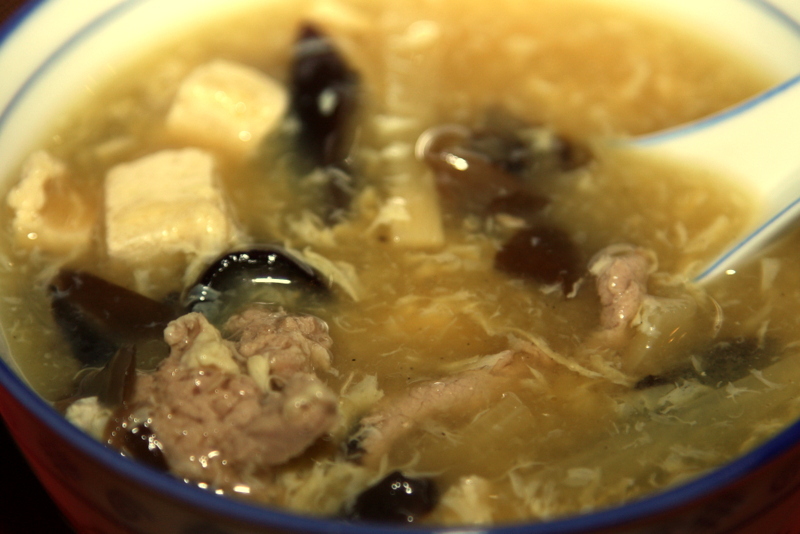 Add pork, mushrooms, and bamboo shoots and return to a boil. Then add tofu cubes and salt to taste (remember that chix broth already has a lot of salt!) Now, slowly stir in the cornstarch paste. 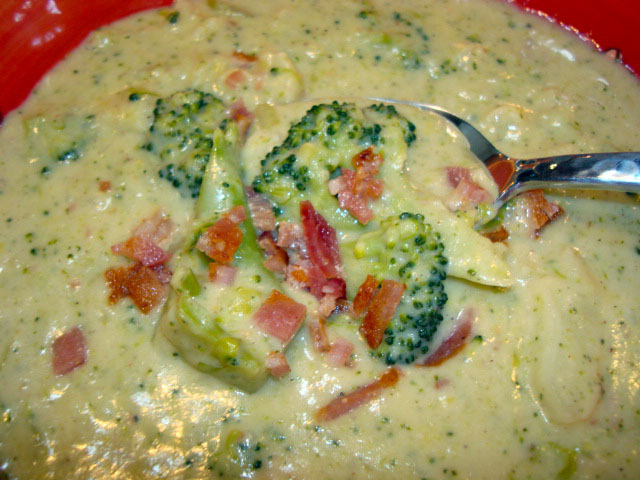 Continue cooking until you see the consistency thicken into a creamy soup texture. Next, S L O W L Y add the beaten eggs while stirring the broth in ONE direction in S L O W circular motion. Then, “fold” in the soy sauce. In a small bowl, mix together vinegar and white pepper. Pour this into the soup and stir. Finally, add the chopped green onions and sesame oil. Even better flavor the next day!!!! 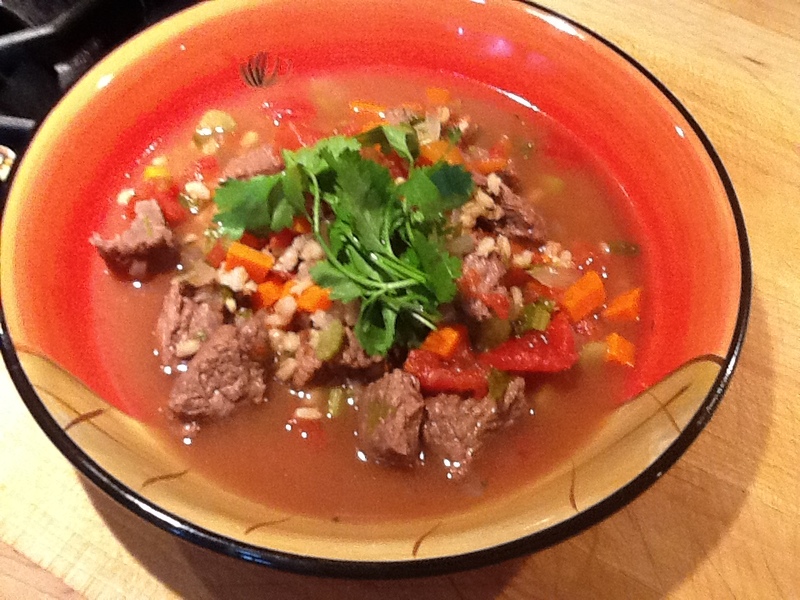 Nothing says “comfort food” like a hearty soup such as Beef Barley Soup. It is made with beef chuck roast but it is also a great way to use up left over Prime Rib from those “special occasion” dinners!! I hope you enjoy!!! • ½ c dry red wine…the GOOD stuff!! 1. Take the bite size pieces of beef and season generously with salt & pepper. Heat 2 tsp of vegetable oil in a 12 inch skillet over med-high heat until just smoking. Add “HALF” the meat to the skillet and cook..”without stirring”, until well browned on one side..about 4 minutes. Stir the meat and continue to cook, stirring occasionally, until completely browned, 5-7 minutes. Then transfer to soup pot and repeat process. OR, take left over cooked beef that has been cut into bite sized pieces and sauté in oil then put in soup,pot. 2. 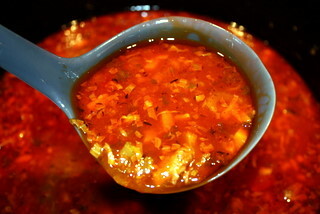 Now as the meat is simmering in the soup pot, add the onions & celery & ¼ tsp of salt. Cook, stirring occasionally, until softened about 4-6 mins. Next stir in the wine, scraping the bottom of the soup pot, and add carrots & stir. Then add tomatoes and thyme, bring to a boil. 3. Once boiling, add the chicken & beef broth and the pearl barley. Cover, and put on low and cook for about 1 to 1 ½ hours…check it!! The MOST IMPORTANT thing is that the meat is tender….don’t ever rush it!!!! And don’t ever boil soup thinking that it will cook faster!!! 2. Now, in a large dutch oven or soup pot, take the slices of bacon and cook them. Once cooked remove the bacon, and chop and put aside…but keep the bacon grease in the pot! Now add 2 TBS of butter to the bacon grease (yes, you can leave the whole bacon process out if you wish) and sauté the onions, celery, red pepper for 2-3 minutes until tender. 3. Now add the canned green chilies and cook another minute. 4. Take the milk and put in a bowl & add the 3 TBS of flour and whisk the flour together with the milk and pour on top of the veggies. 5. Then add the Chicken broth, corn, potatoes and seasoning and bring to a boil. 6. Continue cooking for another 20 mins on medium heat, stirring intermittently. 7. As potatoes get soft, add the shrimp and continue to cook another 10 minutes. 9. Add cheese Quesadillas to make it a great meal!!! Enjoy!!! 4. SLOWLY add the beef broth and stir in the tomato paste, salt & pepper & thyme & parsley and stir. 5. Now add the oxtails back into the soup pot, cover and simmer for about 3-3 ½ hours until meat is fork tender. 6. Once cooked, take oxtails out and cool and then take all the meat off the bones and cut into bite-sized pieces, leaving the fat and bones to discard. 7. Now add the carrots & celery AND the meat back to the pot and cook until the carrots are tender. Mix in the sherry or port wine and serve. First of my "Sunday Sinners Soups"
Cook the bacon in soup pot until crisp and remove with slotted spoon and put aside. Saute onions in bacon grease until golden. Add broth, garlic, broccoli, cauliflower, and potato to a boil in a 4 quart saucepan. Reduce heat, cook covered, 15 minutes. Add half & half. Add shredded cheese and heat until melted. Take 1/3 of soup mixture & pour into blender and puree. 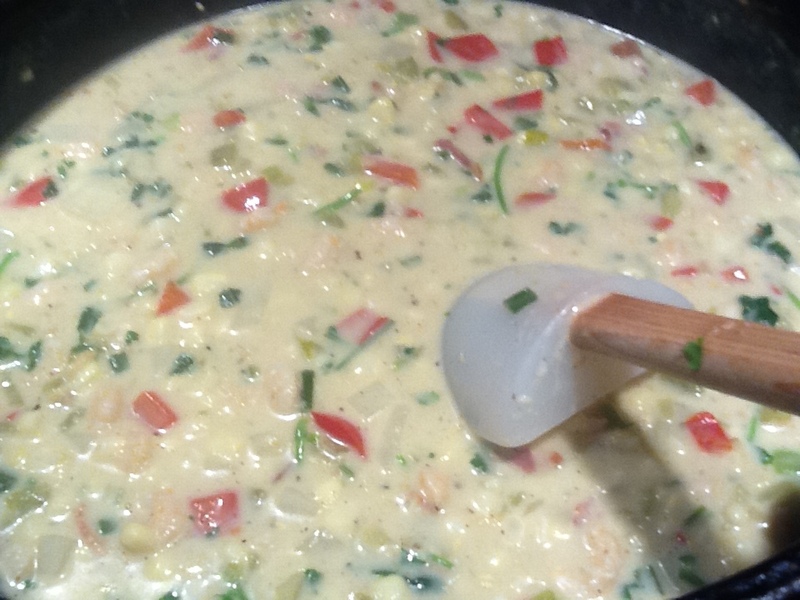 Return pureed soup to pan with reserved vegetables and heat through, but do not boil or cheese will curdle. Take reserved bacon and chop and add to soup. Season to taste. 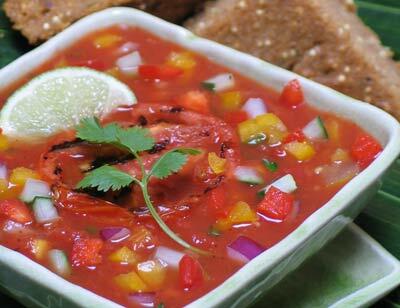 Serve with a salad and a hearty bread and ENJOY!! !